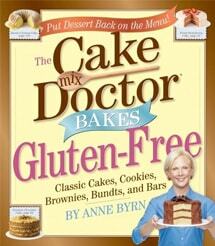 Anne Byrn’s first gluten-free cookbook, The Cake Mix Doctor Bakes Gluten Free, came out two years ago. Now she has released Unbelievably Gluten-Free! Both books are well rated on Amazon. Anne Byrn is not gluten intolerant herself, but she’s a well-known, well-liked cookbook author. Several years ago, gluten-free friends and fans started asking her to create gluten-free recipes. So she accepted and thrived on the challenge. You can probably deduce from the title of Anne’s first cookbook that her recipes are based on ready-made gluten-free cake mixes. Being the author of the same type of gluten-full cookbook, a gluten-free version was a natural progression. Similarly, many of the recipes in her second cookbook rely on baking mixes and other ready-made gluten-free products like bread crumbs and frozen pizza crusts. I’ll be honest … if you don’t use those ingredients, these cookbooks would not be good selections for you. Those “amazing comfort foods” are really the focus of both of Anne’s cookbooks. The first obviously focuses on cakes, but the new one features recipes like Mom’s Chicken and Rice Soup, Buttermilk Biscuits, Hearty Vegetarian Chili, Homestyle Spaghetti Carbonara, Real Deal Gluten-Free Fried Chicken, Crab Fritters, December Beef Stew, and Easy Irish Soda Bread. There are 128 recipes in all. While the focus of this cookbook is what I call “mainstream gluten free” and most recipes are not dairy free, Anne offers tips at the end of the recipes for making them dairy free as well (if needed, a few recipes are both gluten free and dairy free as written). Or if you’d rather, you can enjoy this e-book sampler of six recipes in Kindle format. Or, of course, you can do both if you’d like! There will be two winners. One winner will win a copy of The Cake Mix Doctor Bakes Gluten Free and one winner will win a copy of Unbelievably Gluten Free! ~ Leave a comment telling which book you would like most if you’re one of the winners. ~ Look at the preview of either The Cake Mix Doctor Bakes Gluten Free or Unbelievably Gluten Free! and share one recipe that you would like to make. ~ Subscribe to gfe via email or RSS. Leave a comment whether you’re a new subscriber or current subscriber, and thank you! ~ Subscribe to All Gluten-Free Desserts … All the Time via email or RSS. Leave a comment whether you’re a new subscriber or current subscriber and, again, thank you! This giveaway will end Thursday, December 13, at midnight EST. Last, you won’t want to miss a post so subscribe or check back every day until at least Christmas for the remaining Home for the Holidays posts. I might have started slowly, but I’m *planning* to make up for it! I’m going to accelerate the speed and share briefer posts (a lot briefer than this one I might add … can I do it?). Writing much shorter posts for my new gluten-free desserts site, All Gluten-Free Desserts … All the Time, is giving me lots of practice at being much less wordy, but I still have “relapses.” Have you checked out the new gluten-free desserts site yet? There are dozens of gluten-free desserts recipes of all kinds (and more are being added daily) from the bloggers that you already love and “new to you” bloggers that you will quickly come to love! This post is linked to Allergy-Free Wednesdays and Gluten-Free Wednesdays. Full disclosure: The cookbooks reviewed here and offered in this giveaway were provided free of charge from Anne Byrn’s publisher, Workman Publishing. However, the opinions expressed are strictly my own. I’d like to win “Unbelievably Gluten Free”! I’d love to win Unbelievably Gluten Free! I would like the Unbelievably Gluten Free–and would love to try out the Red Velvet Cake with cream cheese frosting! I have been a facebook subscriber to gfe, but now I am also an email subscriber to both gfe and all gluten free desserts! Many thanks for your wonderful wisdom! I would like to win Unbelievably Gluten Free! So many recipes sound good, chicken lettuce wraps and the cornmeal waffles with mashed banana and chocolate chips sound especially good! I subscribed to Gluten Free Desserts…All the Time RSS. Definitely the Unbelievably Gluten Free cookbook! I already subscribe to you via RSS! I would love Unbelievably Gluten Free! I have her previous cookbook and would love to add this one to my collection as well. I am a current subscriber of GFE! I subscribe to All gluten free desserts. There are too many recipes to close from!! I would live to win Unbelievably Gluten Free!! I am a subscriber to gfe through email. Love getting your posts!! I’d like Unbelievably GF! I have read the other book already! Merry christmas! I have the Cake Mix Doctor bakes Gluten Free and I LOVE it! I would love to have her new book, Unbelievably Gluten Free! Gluten Free Chicken Pot Pie! YUM! I am a new subscriber to All Gluten Free Desserts. 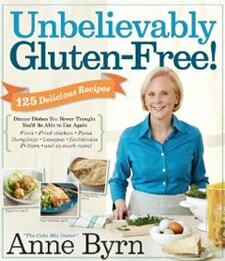 I would love to have Anne’s new book, Unbelievably Gluten Free! I have her other cookbook, and I absolutely love it. I am not a baker, so her recipes using gluten free cake mixes are wonderful for me. I’ve make several of them, and they’ve all turned out great, and they were all delicious! If I win, I can’t wait to try the Irish Soda Bread recipe. I have a “gluten” family recipe that I used to bake, and my family loved it, so I am anxious to find one that I can enjoy! I love getting your posts via email, and I’m going to subscribe right now to your other site, All Gluten Free Desserts – All the Time! 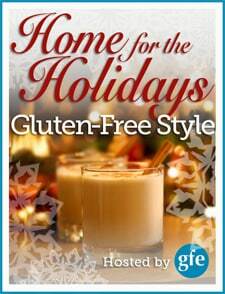 Thanks for all you do for us gluten free foodies, and Happy Holidays to you and your family! I would love to have The Cake Doctor Bakes Gluten-Free. I currently subscribe to GFE via RSS (google reader). I have her first book so I would love to win her newest book, Unbelievably Gluten Free. I subscribe to All Gluten Free Desserts via email. I would love unbelievably gluten free! Thanks for the giveaway! My Dad loves seafood so crab fritters sound amazing! Current subscriber to All gluten free desserts all the time! i currently subscribe and love your website. Since I have neither, either would be a blessing. But the recipes in Unbelievably Gluten Free looked awesome, especially the Pumpking Spice Bread. YUM! I would love to win the Unbelievable Gluten Free cookbook, and would try the recipe for Pumpkin and spice waffles. Thank you! I would like to try the Pumpkin Spice bread, and would be most interested in winning the Unbelievably Gluten Free book. Not sure if the mixes she talks about are all available in Canada. I did try a GF chocolate brownie mix last Christmas that was super delicious though! I want to try the Pumpkin Spice bread and the pie crust! I would like to win “Unbelievably Gluten Free”, the first recepie that I would try would be buttermilk bisquits. I have the most trouble baking GF, so I’d love the Cake Mix Doctor one. Key Lime Chiffon, from the Cake Mix Doctor. YUM! I would love Unbelievably Gluten Free! The Tomato Panzanella sounds great. I’d love Unbelievably Gluten Free! I’d love to win the Original Cookbook…love my desserts!! I’d love to win the Unbelievably Gluten Free cookbook. I have and love the Cake Mix Doctor. Thanks. I would be happy with any of the cookbooks. I am already a subscriber to GFE and I love it! Subscribed to All Gluten Free Desserts! I would love to win Unbelievably gluten free. I subscribed to All Gluten Free Desserts…All the Time! I would love The Cake Mix Doctor. My family loves to bake, but now that two are Gluten Free most things don’t look or taste the same. The Chocolate Cake looks great. Not flat and thick like most GF cakes. New subscriber to All Gluten-Free Desserts … All the Time. Sounds like a great website! I am a current subscriber to gfe! love it! I would love the GF cake mix doctor one! I’d love the Cake Mix Doctor Bakes Gluten Free! I’d love to try the lemon buttermilk poppyseed muffins! Subscribed to All Gluten-Free Desserts…All the Time by email! Thanks! I would love to win a copy of The Cake Mix Doctor Bakes Gluten Free . From this selected recipes I would make the GF baked apricots ! Ok, so it’s already past midnite in your neck of the woods, but since I don’t usually win in these giveaways anyhow it won’t hurt the natural balance of things if I enter anyhow? and first I would bake the carrot cake in the cakemix doctor cook book, and then the apricot white chocolate layer cake! Yum! And I am already subscribing to both of your blogs. Yay! So glad I won the original cookbook! Looking forward to making many yummy treats! Cant believe I won the Unbelievable Gluten Free book! Thank you so much Shirley. I cant wait to get the book and start reading and cooking. Hi Marsha–I’m so happy for you. 🙂 I think you’ll have many choices with Anne’s second gluten-free cookbook!